Finally sharing this finish with you is such sweet relief! I've been working on it off and on since spring, letting it rise to the top of the w.i.p. pile and then be covered up again. For me, it's some of the best kind of random scrappy sewing, and I'm debating starting in on another, as my scrap basket is still plenty full! I used a variation on the Improv Quarter Log Cabin block tutorial that I shared yesterday. The only self-made rule was to begin with a 'square' of natural Essex linen for each 12 1/2" block. That little bit was all the continuity I was after. For quilting, I used a serpentine stitch, basically because I like it and it goes relatively fast. I really didn't need any twisting and turning or fancy stuff for this one. At 72" x 72", I'll just say: I wanted it done. Thread was Aurifil 50wt #2309 (Silver White), which was relatively unobtrusive while still being visible enough on the darker sections to add interest. I save all my binding scraps, and combined most of the solid ones to bind this quilt - blues, grays, and golds. So whew! It definitely feels good knowing I used oodles of scraps in this one. Why the scrap basket is still half full remains a mystery. I like the idea of having a "one rule" to keep the focus consistent. This is a super way to use up our prettiest scraps! The wonkiness is just perfect and just my style. I like the way the scrappy but solid binding frames the quilt. This is definitely a fun options for "eye spy" and is probably a great walk down memory lane for you when you look at the fabrics included. Congratulations on the finish! Another great finish! You are so busy and productive and you always enhence your quilts with your quilting. 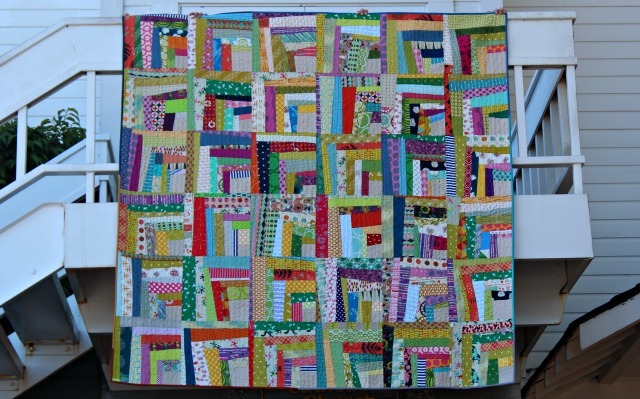 A wonderful scrappy quilt! I've been tempted to make another 1/4 logcabin, great way to use up some of those scraps! What a great way to use scraps. I am growing my scrap basket quickly. i lost all my beautiful boxes of scraps in the flood last year. I always wondered why a quilt took so much fabric but when you make it out of scraps, the basket never empties! Another beautiful quilt you have made. I'm looking at the photos of this quilt and your other quilts and I am admiring the way your quilts are always photographed. I tend to take photos of my quilts around my house since I'm still camera shy taking photos elsewhere. But then again you live in a beautiful city which I am sure there are wonderful places to take photos, even at Starbucks. 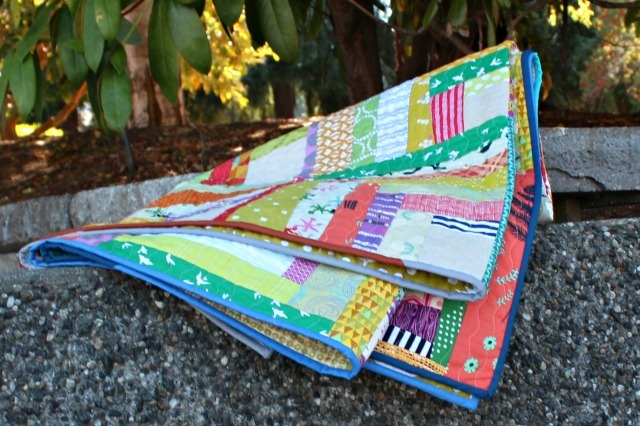 I so admire quilters who manage to make consistent quilts while using scraps. Great job ! what great use of all well some of your scraps looks wonderful. You did a beautiful job with all of your fabric pieces. Love it! 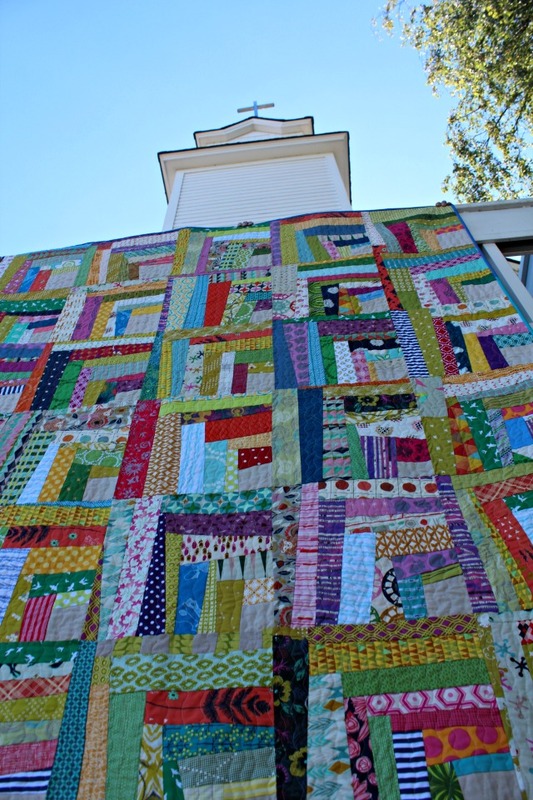 I love the quilt and the individual blocks. Thanks for the tutorial. I think I'm going to try and make a Pincushion with it this afternoon. 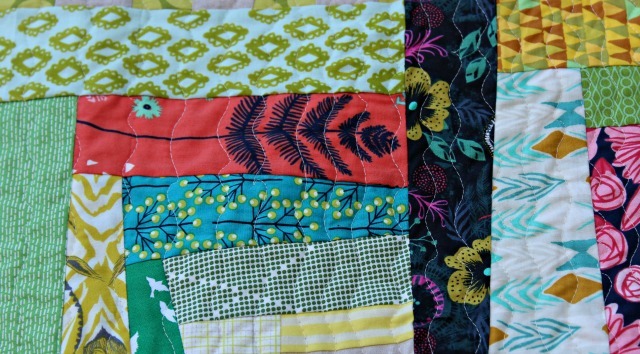 It says a lot about how well curated your fabric choices that a super scrappy quilt like this looks so great!! Maybe there is hope for my scraps! Love the viewpoint with the steeple! Looks awesome Debbie! Great to have it finished. This is such an awesome finish Debbie!! I love it! I started one of my own when you shared your quilt top but unfortunately, I had to leave the one lonely block aside for now. I think your finished quilt is going to push this WIP back to the top of the list!! It's fantastic, Debbie! I love every bit of it, down to the scrappy binding. It is amazing just how far scraps can go, isn't it?!? Beautiful! I know what you mean about the scraps - how can we use so many and still have baskets full? !